SINGAPORE - They had engaged in covert operations and concealed their unlawful conduct. They had knowingly siphoned millions from the church to fund the expensive music career of the pastor's wife. And they had defrauded auditors with falsified accounts and conspired with the intention to cause wrongful loss to City Harvest Church (CHC). The list of misdeeds at the end of Judge See Kee Oon's 15-page oral judgment read like a damning coda to the City Harvest trial. In the judgment, he wrote that the weight of the evidence had led him to find all six City Harvest co- accused guilty of all the charges made out against them. The six - including senior pastor Kong Hee, 51 - had stood trial on varying charges of criminal breach of trust and falsifying accounts. For each count of criminal breach of trust, the six could face up to 10 years' jail and a fine. The falsification of accounts carries a jail term of up to 10 years and a fine. The maximum jail sentence that District Court judges can impose is 10 years per charge, or a cumulative sentence of up to 20 years. 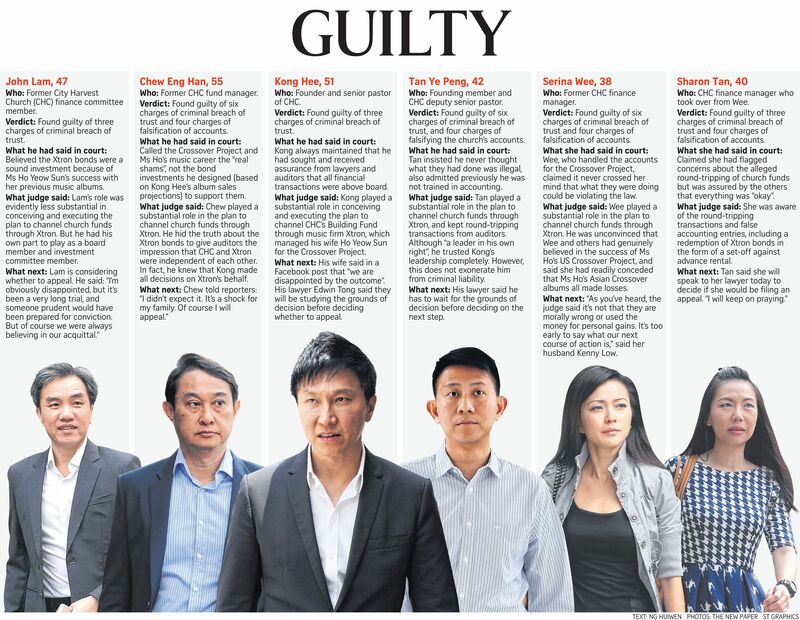 The other accused are deputy senior pastor Tan Ye Peng, 42; former CHC finance managers Serina Wee, 38, and Sharon Tan, 40; former CHC finance committee member John Lam, 47; and former CHC fund manager Chew Eng Han, 55. Bail of $1 million was extended to Kong, Tan Ye Peng, Chew and Lam. It was set at $750,000 for Sharon Tan and Wee. Wee was previously out on bail for $500,000. All six are barred from travelling overseas. Judge See noted that although there was no evidence of any wrongful gain by the accused, this did not factor in his decision as the prosecution's case was "premised on wrongful loss caused to CHC through the misappropriation of CHC's funds". Nor did it matter ultimately if the accused had "trusted completely the leadership of Kong Hee" and acted in accordance with his instructions. "But no matter how pure the motive or how ingrained the trust in one's leaders... these do not exonerate an accused person from criminal liability if all the elements of an offence are made out," he wrote. The six had misused some $50 million in church building funds earmarked for building-related expenses or investments. First, $24 million was invested in bonds from music production company Xtron and glass-maker Firna that were in fact used to fund the Crossover Project - a mission to evangelise through Ms Ho Yeow Sun's music. Later, $26 million was used to cover up the initial misdeed. Judge See noted that Xtron and Firna bonds were not genuine investments but were "wrong use" of the building fund. Furthermore, he said, the accused went ahead with the $13 million Xtron bonds, even though album sales projections indicated that only about 200,000 copies would be sold, making far less money than that needed to redeem the bonds on time. The defendants then devised plans to funnel funds to Xtron "under the guise of legitimate transactions" to help it solve its cashflow difficulties. They also hid the fact from auditors that the company was controlled by Kong and Tan Ye Peng. "I do not accept that they genuinely believed that the sale of Sun Ho's music albums would generate sufficient profit for CHC to enjoy financial return," wrote Judge See, noting that Ms Ho's "perceived success" was inflated as album sales were boosted by the church. Similarly, the "primary purpose" of the $11 million in Firna bonds was to channel money from the church to the Crossover Project. Judge See said he did not buy the defence's argument that money spent on Crossover had a dual purpose of being an investment and serving a "missions" purpose. "These are creative labels tacked on in an attempt to strain and stretch the plain meaning of the word 'investment'," he said. He said the "round-tripping" transactions devised were merely to give the appearance the bonds were redeemed. "The substance of it was that CHC was channelling money through various conduits in order to pay itself," he wrote. Judge See noted the paper trail left by the accused did not indicate innocence, as the defence claimed, but was "more suggestive of a mindset of presumptuousness or boldness". "The weight of the evidence, however, points to a finding that they knew they were acting dishonestly and I am unable to conclude otherwise," he wrote.